Anyone who’s taken a road trip has probably had to use a map at some point. Navigating from point A to point B isn’t always as easy as it seems. Imagine what’s its like then to travel the ocean. How do you know where you are and what’s around you? Well, there are maps for the ocean too. These are called nautical charts. Any location on Earth can be described by two numbers: its latitude and longitude. On a chart, lines of latitude are horizontal while longitude are vertical. Both are actually angles, measured in degrees. If a ship captain wants to find a specific location on a chart, these are the coordinates he would use. You’ll notice numbers all over the ocean areas on nautical charts. These are actually water depths. These numbers are especially important to large commercial vessels that need to protect the bottom of their boats in shallow waters. 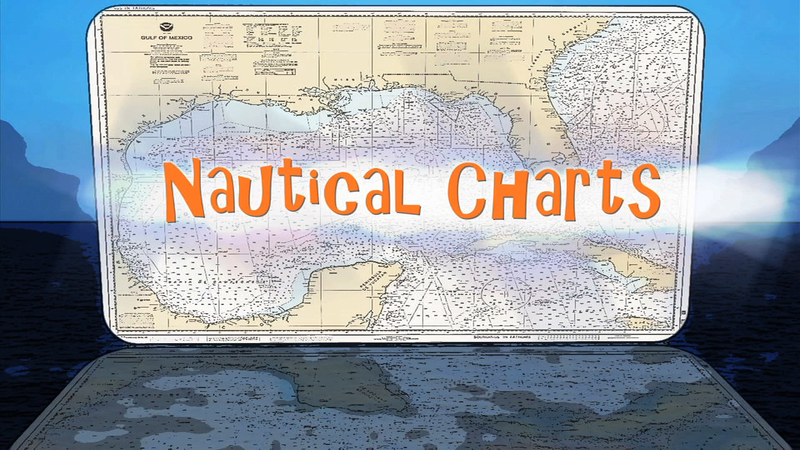 Nautical charts also use a variety of colored lines, shapes, and symbols to show what you will find from the sea surface down to the sea floor. Coastlines can often be an underwater obstacle course of sandbars, reefs, and rocks. Throughout history, a variety of ships have sunk to the bottom of the ocean. The locations of these shipwrecks may be noted on a chart. Blue lines are used to distinguish areas of protected habitat, like a marine sanctuary. These areas may be home to beautiful islands, corals or marine life, some of which are endangered. Nautical charts are road maps of the ocean – helping sailors, fisherman, explorers, and scientists find their way around the big blue sea. Electronic Nautical Charts are now available from NOAA for FREE! From South Carolina to Maine on the US East Coast had to be re-mapped after Post Tropical Cyclone Sandy because of changes to the seafloor and debris. NOAA operates four large ships dedicated to hydrographic surveying: Fairweather, Ferdinand R. Hassler, Rainier, and Thomas Jefferson. Each ship is equipped with the latest echo sounding technology to measure water depth and identify submerged hazards to navigation.